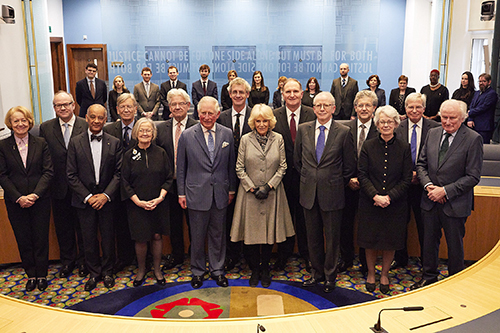 Yesterday (5 February 2019) was a very special day here at the Supreme Court and Judicial Committee of the Privy Council as we were delighted to welcome Their Royal Highnesses The Prince of Wales and The Duchess of Cornwall during our 10th anniversary year. Their Royal Highnesses viewed all three courtrooms, and the library, and met with all Justices of the Court, including the President, Lady Hale and Deputy President Lord Reed. Members of staff - from the Corporate Services team to members of the Registry - also got a chance to meet the Royal couple and talk about life inside the UK's highest court. The Prince and The Duchess saw items from The Supreme Court and Middlesex Art collections, including the official portrait of Her Majesty The Queen opening the building ten years ago; a bust of King Edward VII; and a portrait of Charles I. Their Royal Highnesses also viewed some of the Court's finest artefacts including the letters patent of appointment, the Supreme Court seal and Lord Kerr's robe. During the visit TRH heard about the role of the Judicial Committee of the Privy Council and admired the Court's unique architectural features. To close the visit Lady Hale said a few words and presented TRH with a few gifts including Supreme Court and JCPC teddy bears! Prince Charles then made a short speech in which he spoke about the important work of the Court and wished us all well in that work. This marvellous occasion was a fine start to a year of 10th anniversary celebrations.